A programme dedicated to high school learners, the Geekulcha Vacation Work(VacWork) programme aims to groom the Geeks of the future through ICT and Business Skills. Since 2014, the VacWork has taken youngsters to a simulated working environment where they learn, get mentored by the Geeks and build products/services using ICT tools. In Gauteng, the programme is implemented in collaboration with The Innovation Hub, City of Tshwane and mLab Southern Africa. As such, more often, the programme is hosted to complement the Youth FabLab programme in Tshwane and Soweto. The programme is open and free to high school learners whom are told to make the best of their experience and knowledge gained during the programme. In 2015, three youngsters came through the programme hailing from Attridgeville and Mpumalanga who were taught about electronics. 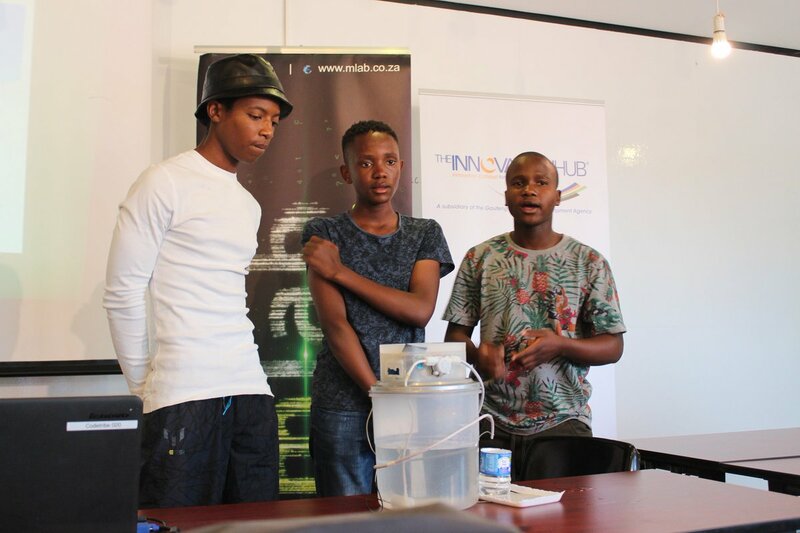 Njabulo Sibiya, Moses Mhlwana and Ndumiso Cossa saw an opportunity through the Hack4Water challenge and entered one of the solutions. Hack4Water is a national competition by the Department of Water and Sanitation to challenge developers to use Open Data in addressing the water crisis. Participants made video submissions of their solutions to make the cut to top 25 in the country. The three friends created a prototype of a smart tank that saves water by enabling users to digitally select the quantity of water they need. It then dispenses the exact measure required. Water does not get wasted because the tank is connected to containers that collect spilt water . The tank has sensors that detect the amount of moisture in the soil. When the soil is dry, the tank automatically releases the optimum amount of water. It can be used anywhere by anyone, but farmers and villages with water shortages are expected to be the main customers. Subsequently, the 3 youngsters made it to finals of the Hack4Water challenge and won a category prize at the World Water Day gala dinner. For high school learners, winning R15 000.00 is not bad. Geekulcha congratulates them. We hope that these 3 youngsters will continue the Momentum for more innovative ideas, inspire others and build empires that would employ thousands.